The Arabian Gulf’s world-class hospitality is highlighted in this episode as Martha prepares flavor-packed favorites perfectly fit for a crowd. The menu features chicken kabsa, stuffed cabbage and spiced lamb chops, orzo risotto with wild mushrooms, and a sweet cake called kumajj. This orange-ginger yogurt cakes recipe appears in the "Entertaining for a Crowd" episode of Martha Stewart's Cooking School. Bring sugar, ginger, orange zest, and 1/2 cup water to a simmer in a small saucepan, stirring to dissolve sugar. Remove from heat and let stand for 15 to 20 minutes. Set syrup and candied orange zest aside. Preheat oven to 375 degrees (about 190 degrees C). Thoroughly coat the six (1-cup) molds of a mini Bundt pan with vegetable spray. In a medium bowl, whisk together flour, milk powder, baking powder, and salt. In a separate medium bowl, whisk eggs, yogurt, oil, and vanilla until smooth. Add to dry ingredients and whisk until thoroughly combined. Stir in nigella seeds just until incorporated. Divide batter evenly among molds. Bake until firm, puffed, and golden brown around the edges, about 15 minutes. Transfer pan to a rimmed baking sheet fitted with a wire rack. Spoon 2 tablespoons reserved syrup over each cake; let stand for 15 minutes. When ready to serve, invert pan onto cooling rack. 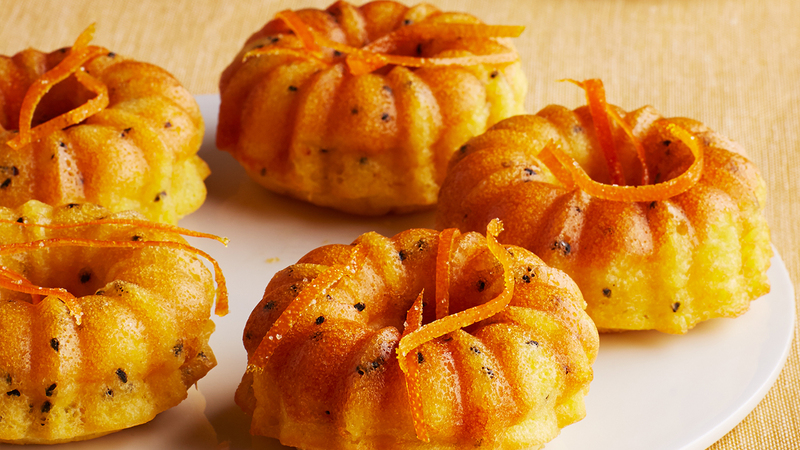 Serve cakes drizzled with remaining syrup and garnish with thinly sliced candied orange zest, if desired.